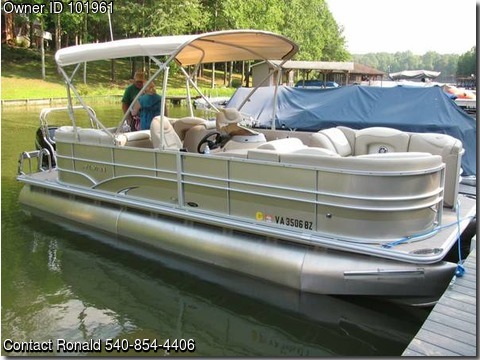 Boat is located in Mineral, Virginia - Call 855-600-7750 - Full Financing Available - Extended Warranty - Insurance - Nationwide Shipping - 2016 Upgraded Sylvan Tritoon -- length, 23'10" -- beam, 8'6" -- tube diameter, 25 in. -- tube gauge 0.080 in. -- dry weight, 2,295 lbs. -- max persons, 12 -- max capacity, 2,200 lbs. -- fuel capacity 30 gal. -- RPT (high performance) tubes -- performance shield (full metal under shield) Champagne color scheme -- includes full fiberglass molded console w/windscreen -- instrumentation including tachometer, fuel gauge, speedometer, trim gauge, voltmeter and GPS/depth/fish finder -- 12 volt receptacle -- high back helm and companion chairs w/swivel, slide and armrests -- Rotocast Furniture Bases -- upgraded 32 oz tan vinyl pillow top furniture -- lounge arm change room -- sea weave flooring -- upgraded stereo -- table with cup holders -- docking lights -- concealed mood lighting -- 10' Bimini Top -- playpen cover -- winter storage cover -- through bolted deck cleats -- anodized deck trim -- 1-1/4" anodized railing -- rear entry boarding ladder -- front, rear and side access gates. Mercury Verado Outboard Specs -- Horsepower 225 -- Inline 6 (4 stroke) -- displacement 2.6l -- full throttle RPM 5800-6400 -- SmartCraft Digital Throttle & Shift -- electro-hydraulic power steering -- Advanced MidSection (AMS) -- water cooled supercharger -- cold air intake. Boat is one year old with under 20 operating hours total -- all servicing is up to date -- includes toys, life jackets and all other items -- located at Lake Anna. We love the Tritoon but need to sell for health reasons! This boat does not include a trailer.